You might not know who Candide Thovex is now, but trust me, by the time you finish this article, you will probably be more than a little in awe of him. His latest video is averaging 1.5 million hits a day and counting since going live last week. It could easily be the single best action spots video we’ll see all year. Today, I’ll break down why I think it’s so successful, and how we can apply the same techniques to our own work. Like probably 99% of you reading this, I didn’t know who Candide Thovex was until a few days ago. Then I stumbled upon his latest epic video, 'One Of Those Days Part 2' and was blown away. The video is genius - it's a blend of perfect simplicity with great production and thought behind it, and astounding execution. Turns out Candide is actually one of the best skiers in the world – and it’s not difficult to see why. Before you do anything else today, check out his latest video below, it's totally-off-the-wall insane. His first video came out almost 2 years ago and has since racked up a significant 1.9million views. Almost 2 million views is not to be sniffed at - but his new piece has already smashed that record more than 3 times over and in just a mere 5 days. What Causes A Video To Go Viral? The causes of virality are certainly not always clear cut. Last week, I experienced my own taste of what happens when your work can go viral with this BTS video I shot of Vincent Laforet on an aerial job back in November of last year. It’s racked up 100,000+ hits in the last week alone, but had been online for a couple of weeks before that, but hadn’t gotten more than several thousand views before that time. A post by Vincent on the Storehouse site caused it to start generating noise and eventually getting picked up by news channels globally. Just over a year ago, as some of you may remember, I accidentally brought down Fstoppers for several days when I posted an analysis of the then new Volvo truck commercial, featuring the Jean Claude Van Damme and his epic splits. 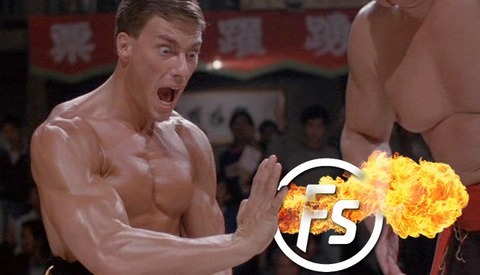 The article ended up with somewhere in the region of 800,000+ views or so and took off when JCVD actually ended up seeing the article and posting it out to his own social network, causing a giant feed back loop to the original article on Fstoppers. These causes of something going viral can sometimes be difficult to figure out and orchestrate. However, I think Candide’s latest epic video gives clear reasons as to why it’s racked up 7 9 million views in 5 7 days. While this doesn't mean we can all go out and start creating viral content, this sort of simple analysis is something we can all bear in mind when we are looking to reach a wider audience with our work. I’ve set out 6 key points below which we can all think about when producing our own work and hoping for it to get traction and be picked up wider than what it is now. Without a doubt, even for those of us who don’t really ski (I’m one of those people), the visual content of this video is jaw droppingly insane. The moves, tricks, sense of speed and skill in this video are all just incredible. We have to start with outstanding content as a baseline – but that by itself isn’t going to be enough to make a video great (Candide’s first video is good evidence of this. Two million views is great, as is the video itself, but it’s taken 2 year to get to almost 2 million views compared to the sequel which has more than 7 million in less than a week). Candide edits the video so it feels like we’re not only there with him, but rather, that we are actually him. The camera placement immerses us totally in the feeling of what it must be like to experience what he is going through. Some neat trickery with After Effects shows him putting his goggles on in the mirror with apparently no camera visible as he looks at his own reflection (this simple but highly effective trick is relatively straight forward to do in post). The goggles go over the camera (the screen, our eyes) and we are right there in the moment, not just with him, but actually as him. A subtle but important point to set the context for the main body of the film. We then see him (us) look up and watch a flock of birds, only to tilt down and have been magically teleported to the slopes through the use of a seamless edit transition. These great little touches totally add to the immersion and feeling we are watching something that looks simple but has been carefully put together. I grew up making videos set to music, and watching countless music videos and seeing how the visuals and audio worked together. Why does not having music work here? It simply adds another layer of immersion, so we feel we are actually there on the slopes, racing as Candide. No music in an action sports film is almost beyond comprehension these days yet without the ‘distraction’ of the music track, it pushes us to engage our visual senses even further. Ambient is in. The opening is genius. 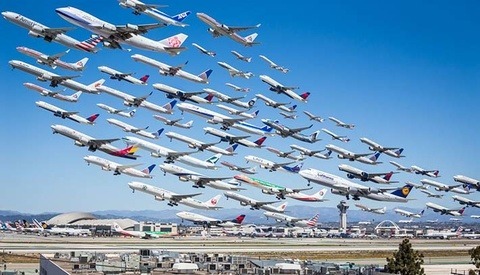 Getting up, brewing and drinking some tea and putting on clothes while calmly taking it all in as birds soar over head…and then ending in one of the most insane finales to any ski run I think anyone of us has ever seen. The key - start small and draw the audience in through to the big finale and climactic pay off at the end. Leave them scratching their head wondering what it was they just saw, because doing that will cause them to hit replay immediately (which is exactly what I did the moment I finished watching the video). We’ve all become slightly obsessed with the over use of extreme slow motion and while I still love it, like everything else in the tool kit, I’m a big fan of using it in moderation and when necessary for greater narrative effect. Candide uses slow motion for those moments where our brains probably couldn’t comprehend the sheer craziness and expert skill of what he’s doing so going into a brief slow motion transition really helps us see and experience what he is doing. When Candide skis over rocks, grass, through the mountain itself into the seemingly pitch dark tunnel around the 3min 55second mark, the ski lift jump, right through to the epic surprise ending, he constantly leaves us shaking our head in disbelief. This visual "discombobulation" effect of messing with our heads is a great way to get us to share the content with friends, as we want nothing more than to have them relish the same disbelief we ourselves did. There is no magic formula to have a video or your work go viral. Conversely, it’s not exactly rocket science when trying to look at ways to maximize the chances of it happening - or at least setting up a video to have good penetration amongst the intended audience. If you start with great content, build in some nice surprises and originality as you go from a slower start to a climactic ending, using motion and speed changes in moderation, you’ll be well on your way. Have your experienced any content or videos you’ve produced that’s gone viral? What do you think the causes are for virality? Share in the comments below! Not just a GoPro video. Nicely done production... Good article as well. Pretty good skier, although I wouldn't bet on him having a long life. The only issue I have with the video is that it appears to be edited to give the appearance that the course is much longer than it really is and that it was done in one shot. Music can help make or break a video. I say just be very careful in your choice. When in doubt, don't use any. It's quite obviously pieced together. but i think it's been designed that way. I didn't interpret it as in any way trying to deceive the viewer with a "faked one shot". It's simply felt like a statement piece around the theme of "let's show what it's like when i wake up and go hit the slopes for a day" type of thing. So, there's a few things to point out. First, he's not just pretty good, hes one of the best skiers out there. His command of skill in the park, pipe, and back country are extraordinary. He's also a very humble and down to earth guy who just loves to shred. Second, there are plenty of mountains out there where you can piece together a 5 minute segment from one run but the purpose of most ski/snowboard/extreme sports segments is to show off the best tricks from whatever session(s) the clip is for. It's called, 'One of those days', not, 'One of those runs'. Third, 'La Clusaz, French Alps' is his home resort. Most resorts will work hand in hand with their local pros to create film such as this. You can take a peek at Mammoth Mtn and see they have continually dish out millions to create some of the craziest features for photo shoots. There might only be one pro there to film too. When he skied through the Giant Slalom course or launched the ski lift in the second movie and treated the people on the lift as slalom poles in the first one, I really doubt they authorized that. Anyways, watch the Winter X games for skiing slopestyle and pipe. Have your mind blown, not even the top snowboarders can top the vertical height alot of these guys can accomplish. Actually I'm fairly sure it's all authorised. A few of those shots involving other people would not only have to be incredibly serendipitous in their timing, but would have been very irresponsible otherwise, and for things like the char lift drop, you can see his ski marks from where he's done it before. Plus those two about to get off are in fact the only two on the entire lift (which appears to be stationary). 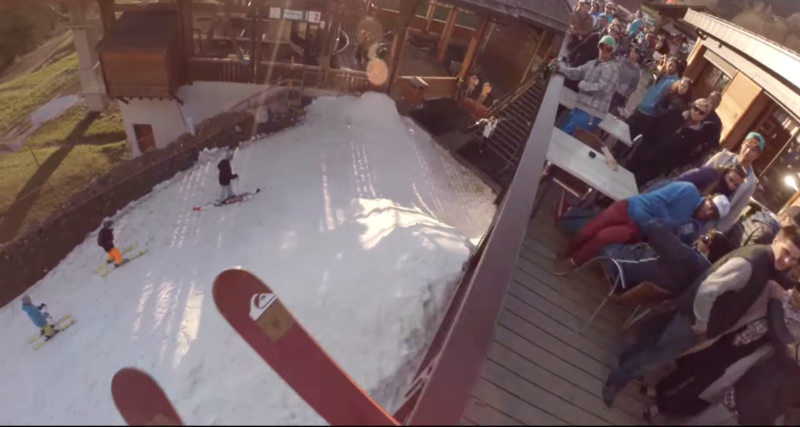 Just so we are clear, this is obviously staged (probably with permission— why else would there be a perfect trail of ski-able snow on a restaurant deck and the tracks from his test run on the ski lift). This does not belittle the video at all, in fact, quite the opposite. 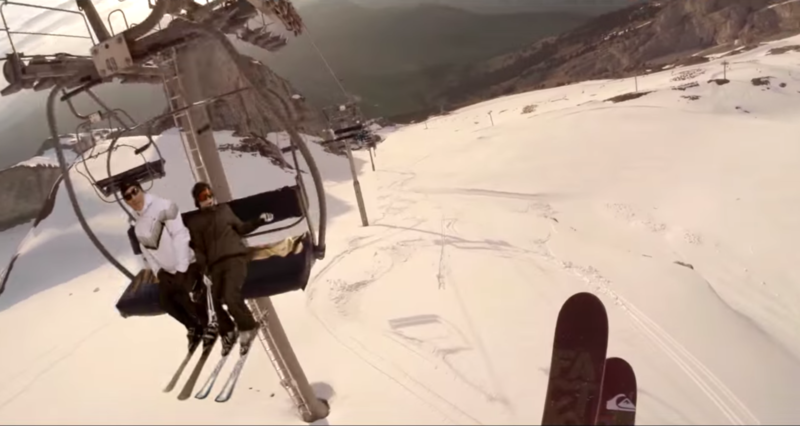 Not only is he a daredevil skier, but he also knows how to put together a tight production. I actually have more respect for him knowing it was not just some idiot out there with no regard for other people. Good on him. I think the article could be expanded to Section 7 - Getting It Seen. 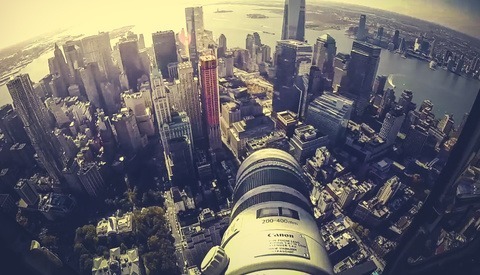 It briefly touches on the Vincent Laforet video and how it was featured on Storehouse. If you don't have a big following and aren't already backed by Red Bull, GoPro, or the FStoppers Writers, you might need to do a bit more legwork than just posting your quality video on Youtube and Facebook. You'll need to send it off to a few blog writers with a larger audience than your own network to get the ball rolling, or tag appropriate social accounts who could re-share it when you do post it. A lot of times people will post to Youtube or Vimeo, tweet the link out, and wait for the views to roll in. The Laforet video peaked at 1,700 daily views, went down to 50 daily views, until getting picked up by Storehouse and hitting 10,000+ daily views. Mike - very much agree - the problem is, you never really know who will pick it up and what will happen to it. I'd more or less written off my BTS video as just getting the occasional view, and i know Vincent had no idea about the response his images would get. You just can't really anticipate the demand for "stuff" (although you might have an instinctive feel for how 'cool' something you shot will be, you'll never really know how that can equate to view count). I certainly agree though - unless you put it out there, AND make an effort to connect it to those that have a voice, the likelihood of it being picked up and seen and going viral is reduced. I re-watched this video 3-4 times when I saw it yesterday trying to figure out how they shot the goggle scene. I assumed that they had hid the camera under the black hat (who wears black ski hats?) but when the goggles go over his eyes and the camera at the same time, I just cant figure that out, unless you had the camera directly over your nose.... Maybe someone can explain it in more detail? Maybe, if you shot this in two takes with green screen? seems like an overly complex solution. Shoot you putting on the goggles over a gopro mounted on your head while you look at a green screen. 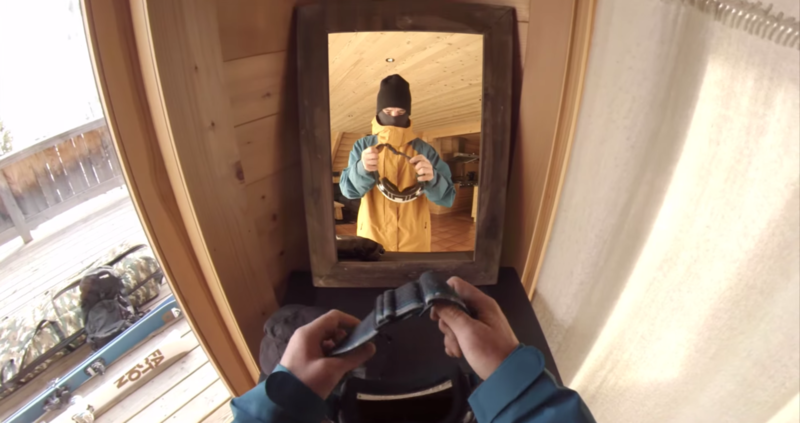 Then shoot you wearing a black ski hat with a gopro mounted under the hat, with a hole cut for the lens, put on the ski goggles as normal over your eyes. 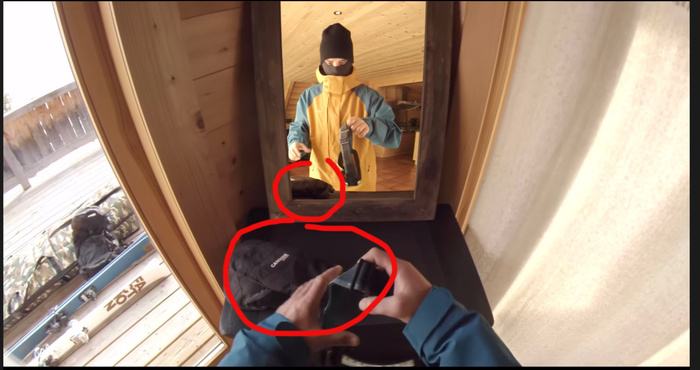 Use AE to remove the black gopro lens on the black hat in the second shot... the second shot is the primary shot and you key in the goggles to match the frame? I still cant figure it out. In the 3rd frame grab you can see we have a strait on shot but his face is tilted down. This seems to say we arent looking at the same shot. I feel like the solution is simpler than this as it is a 2 second part of a ski movie. No green screen, but definitely two takes. Take 1: GoPro mounted on the mirror; facing Candide. Take 2: GoPro mounted on Candide's head/face. The footage from Take 1 is used as the top layer. The edges of that image are cropped to fit the mirror. The image is also keyframed to move slightly as Candide's perspective changes in Take 2 so that it's edges remain within the frame of the mirror. (There is slight movement in the wood panel ceiling to suggest that this is what he did). What do you guys think? I think your right. If the camera is mounted on his head and pointed down slightly then you would not see the ceiling reflection in the mirror. 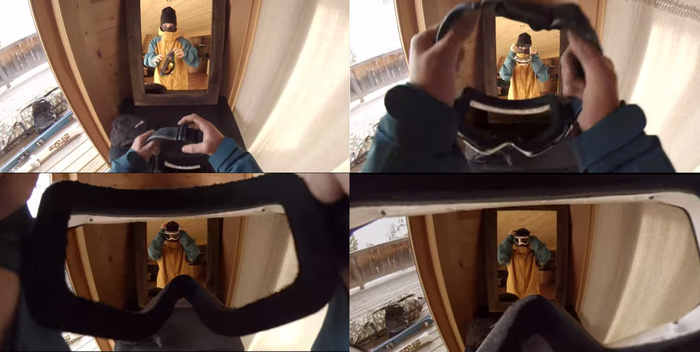 It looks more like the camera was placed on a tripod in the center of the mirror, pointed at the skier, to shoot the mirror shot, then composited in in AE. Second shot is standing in front of the mirror with camera on head putting goggles over the camera lens in sync with the first shot. No green screen needed, just manually keying the first video to the corners of the mirror. It does get tricky with the goggle lens, they could have also removed the goggle lens and added a lens effect on top of the image. I'm still trying to figure that out as well! lol. It was well done! Anyway Awesome video! It's definitely two different shots. Look at his left hand, it doesn't sync up with the mirror image when he begins to grab the goggles. Green screen maybe? My bet is that it was shot in two different takes (one looking at him from the mirror and the other with the POV), it's easily done with a single camera. Green screen was definitely involved, and they composed and synced the two shots on after effects or any similar software. It's easy to see that the reflection doesn't really mimics his movements (hands in different positions). Even though, it's really tricky to use a green screen due to the colour shift when he puts the googles. I had a video about making One-Pot pasta that got 100k hits in less than 24hrs. Does that count? That was an incredible video, ESPECIALLY the last third of it, wow! I had a craigslist ad go viral in April. I was trying to sell an old lens and I was getting nothing so one afternoon I wrote a 'zero f*cks given' ad and forgot about it. Next thing I know it is popular on Reddit and PP picks it up. haha Sasha that was you? I remember reading that ad and thinking you were going to get way over market for the brilliance behind that piece. Did you ever do the transaction in the briefcase with the spaghetti O's? I'm sure the entire internet photography community wants to know how the final transaction went down! No, I was down but the guy who bought it just went for discount tier #1, not the full monty. Looking back I think I would have held out for someone willing to do the briefcase exchange and filmed it. Seeing peoples reactions would have been great and might have gone viral by just using the momentum of the first post. Here was my response picture on Reddit. Wow! DAVID! Blown away, what a great article! Amazing video. David, do you know what type of AE composition the mirror and bird shots would be called? I'd like to see if there are any tutorials to be found.